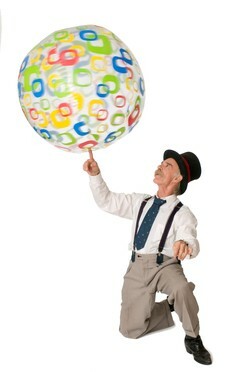 Super Scientific Circus will be presented at 9:30 a.m. and 12:30 p.m. Wednesday, March 7, in W.M. Turner Auditorium as part of the SFA Children's Performing Arts Series. NACOGDOCHES, Texas - Area students will learn that science can be fun and exciting when the Stephen F. Austin State University College of Fine Arts and the Children's Performing Arts Series once again present Super Scientific Circus in two performances Wednesday, March 7, in W.M. Turner Auditorium. Widely popular among CPAS audiences, Super Scientific Circus features circus skills, magic tricks, comedy and mime to illustrate fundamental scientific concepts such as gravity, air pressure and ultraviolet light. The program, which targets students in kindergarten through 12th grade, is designed to "help students understand that science can be appreciated in everything we see and do," said Diane J. Peterson, SFA Fine Arts Box Office manager and director of the Children's Performing Arts Series. Programs like Super Scientific Circus have been favorites among area students and their teachers and are almost always sell-out performances, Peterson said. "Teachers will want to make reservations for their classes as soon as possible to ensure their students have the opportunity to experience this fun and educational performance," she said. Performance times are 9:30 a.m. and 12:30 p.m. Tickets are $6 for individuals and $7.50 per person for groups of 20 or more. For tickets or more information, call the Fine Arts Box Office at (936) 468-6407 or visit www.cpas.sfasu.edu. This year's final CPAS performance is Virginia Repertory Theatre's "The Ugly Duckling," the Hans Christian Anderson fable of the swan who grows up "ugly" in a family of ducks, later to find his appearance changing as he discovers his true identity. Performances are on Friday, April 27, in Turner Auditorium.